Do People Believe 419ers? You Bet! My local small town newspaper has a Police Blotter section every week, where reports of various incidents are described. I'm also a radio communications hobbyist and occasionally listen to a police band radio (oh, yes, I'm one of those geeks). Every month or so, the Police Blotter listings include some type of report of attempted or successful internet fraud, whether it be an ebay auction gone bad or a 419 email. Yesterday, while listening to the local Sheriff's radios, I heard a dispatcher sending out a deputy to someone who received an email about UPS holding a millions dollars for a citizen. The deputy didn't even have to acknowledge before I suspected a 419 attempt in the works. Benin told me that before the check will get to you that it will expire. So i told him to cash $1.5millions united state dollars all the necessary arrangement of delivering the $1.5millions united state dollars in cash was made with UPS DELIVERY COURIER COMPANY. This in the information they need to delivery your package to you. 3.YOUR CURRENT HOME TELEPHONE AND CELL NUMBER. But let's examine what happened here. A resident of my county received this message and gave it enough credence as either a legitimate offer or a serious enough crime to report to the local sheriff (perhaps thinking they were being specifically targeted). I didn't hear the disposition, but it's unlikely that the deputy had enough online fraud experience to evaluate the offer or know to whom a report should be forwarded. It's folks like my fellow county resident—who may be new to email or haven't ever heard about 419 scams—that I fear for the most. Their hides haven't hardened to the impenetrable shells that we who receive thousands of spams a day have developed over the years. 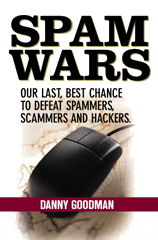 They are susceptible to online scams and are in bad need of public education about them. Don't get me wrong. The dealings I've had with my county sheriff deputies over the years have really impressed me. Mostly Andy and none of the Barney.